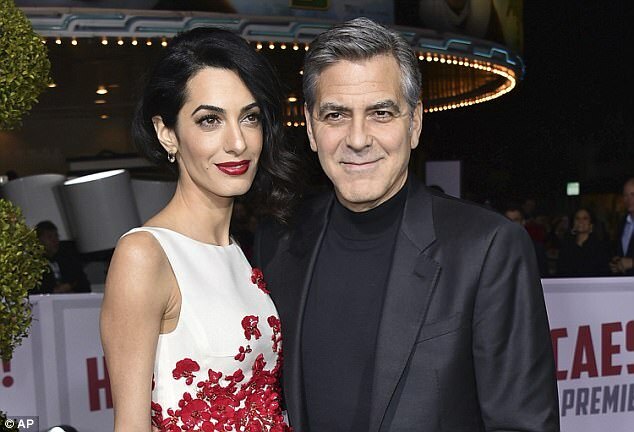 On a bright morning at the Toronto Film Festival, George Clooney — in town to promote the new film Suburbicon, his first directorial effort since the ill-fated The Monuments Men in 2014 — has made it all of a yard into the Ritz Carlton Hotel room before he is showing baby photographs. ‘Get a load of this!’ he urges, beaming from ear to ear as he thrusts his mobile phone into my face. He is thinner than he was and has new-dad shadows under his eyes. But the source of his joy is immediately apparent in the two ridiculously adorable three-month-olds in the picture — a big, bonny boy chuckling mischievously into his open fist and a serene little girl with enormous doe eyes. Ever the professional film-maker, he squints at the shot. ‘She takes a good picture,’ he nods in quiet approval. The twins certainly look a happy pair. ‘They don’t cry,’ he says, proudly. ‘I cry more than they do. I cry four times a day right now, because I’m so tired. He sighs, trying, not especially successfully, to affect wistfulness for the time before his family came along. ‘Wasn’t that great?’ he asks. He is joking, of course, with the nostalgia act. But later, over a cup of coffee, he agrees that since June 6 this year, when he and his wife Amal, 39, were joined by babies Alexander and Ella, his life has changed in ways he could not have predicted. ‘Although I wasn’t completely unaware of what life would be like,’ he puts in. ‘All my friends have kids and I’m godfather to about 20 of them, so I knew what I was in for. The surprise for me was how much more complicated twins is than just the one — it’s not just twice as much work, it’s more than that. And it’s not even so much work for me, because these two knuckleheads don’t even care that I exist right now! ‘All they want to do is eat, so I have nothing to give them except a bottle once in a while (expertly, he crooks his elbow to mimic picking up and feeding an infant) and they’re happy about that, but it’s mostly Amal for them at the moment. I don’t even really understand what’s going on. The other side of the sleepless nights is pure joy. ‘All of this is icing on the cake,’ he says. ‘Look, I’m 56 years old and I didn’t think it was going to happen for me. I thought my life would be focused on my career, not relationships, and I’d sort of accepted that. ‘And then I met Amal and I thought, “Well, I have this incredible relationship, this is wonderful.” And then... all of a sudden we have these two knuckleheads around who make me laugh every day. ‘Really, they’re funny kids. He just eats and eats and sits and goes “uh-uh” and I have never seen anything eat so much in my life. ‘And she’s very delicate and feminine, and she’s all eyes and looks like her mother. ‘I suppose it makes sense that they should be so different, but I hadn’t seen it first hand before and it really makes you realise how much nature is part of who we are. He is not, of course, a young father. ‘I feel like Tony Randall!’ he jokes (of the late U.S. actor who became a first-time father aged 77). The idea of George with a Zimmer frame is hard to contemplate. He is also, beneath the jokes, thinking hard about the values with which he will raise the pair. ‘I have always felt a great sense of responsibility to other people in the world, but when you have children of your own, you realise you are responsible for their lives in a way you haven’t been before. ‘And you become conscious that you want to make an example of your own life that they will follow. ‘I want to make sure my children understand they have been given things other children haven’t been by accident of birth. ‘They could just as easily have been born in Syria and their lives would have been completely different. Although his own father was a television presenter in Kentucky and his beloved Aunt Rosemary was a famous singer, he was certainly not born with a silver spoon in his mouth and says firmly that he never intends to forget that. ‘I grew up in Kentucky, I was a struggling actor for ten years and I have a great understanding of what it’s like to try to make things work. ‘I would buy suits that were too long in the leg, cut the bottoms off and hem them up with a stapler, and use the leftover fabric to make ties for work. I worked cutting tobacco in the fields for three dollars and thirty cents an hour. But it wasn’t the worst job. At 18, he worked in a large shop in Cincinnati where, he claims, some customers had had surgery to remove a toe so they could fit into tight shoes. ‘I worked at a ladies’ shoe store and, oh, man, there were some terrible shoes I sold. This was 1979, 1980 and there was a whole generation of older women in that part of America who had had their fourth toe cut off so they could wear these really narrow pumps. And the downside of fame? Don’t get him started. ‘I remember when I was looking for a job and couldn’t afford to go to the dentist because I didn’t have insurance, watching Lifestyles Of The Rich And Famous — remember that TV show? ‘So if you ask me what my life is like now, answering the question is tricky because I could tell you the truth, which is that I miss walking in Central Park with my wife and my kids — I would like to do that but I can’t. ‘I miss certain elements of privacy that I won’t experience again. As for Amal, he says she is handling her new life as she handles most things — with grace and a healthy dollop of humour. ‘It’s funny because she’s such a professional and so elegant and she doesn’t really do interviews, so people tend to tiptoe around her a lot — but once they start talking to her, everybody realises she is actually a very funny person. Some of that sneaking around is done at their newly refurbished home in Sonning, Berkshire. ‘When we’re in England we go to the pub once a week — The Bull, it’s a cool pub. It’s really old and the doorways hit you low because people were shorter then, which is dangerous when you’ve been drinking! Meanwhile, back in Kentucky the new grandparents could not be more delighted. ‘We’ve just been to visit them. My father hadn’t seen the babies because he had a bout of pneumonia and didn’t want to fly, so we wanted to go there and spend some time with him and my mom. ‘They are thrilled about the whole thing, and also think it’s hysterical because they see everything I’m about to go through and they know what it’s about! But they love it because they get to be grandparents again — my sister has two kids and they love being grandparents. ‘They have an Iraqi refugee staying with them — I don’t want to name him because he has family in Iraq and they are still in some danger from ISIS. Suburbicon, the new film George is directing, is a pitch-black comedy written by his friends the Coen brothers. It details the downfall of a middle-class white family in Fifties America, against a backdrop of racial unrest — an atmosphere George says he remembers from the Sixties. The film, recently given four stars by the Mail’s Brian Viner, who saw an early screening, has two parallel stories. Matt Damon and Julianne Moore play a couple living with their young son in a Stepford-like town whose life is turned upside down when their home is broken into by two hapless criminals. Meanwhile, the house opposite, occupied by the town’s only black family, is being targeted by racists. Damon is an old pal of George’s — ‘He likes playing buffoons,’ George notes gleefully — and making his big-screen debut as Matt and Julianne’s son is 13-year-old British newcomer Noah Jupe. To sum up, life is pretty nice in the Clooney world. ‘There was a basketball coach named Jim Valvano who was dying of cancer, and he made a speech about how you should laugh very hard every day and be moved to tears every day, and never give up. Suburbicon will be in cinemas from November 24. A really good read. I'm surprised that George was willing to be interviewed by the DM after it ran that reckless and inaccurate story about Amal's religion in 2014. That's ridiculous I'm under 30 and I have interest in him and his movies. You can see he's so popular among the young audiences at TIFF. Media savvy, you could say the same about an awful lot of recent films, but you can't deny those scenes in Toronto last week. As is made clear, this interview was done on a one to one basis at the Ritz Carlton last week, like many others. The journalist was one of many that day, and got a few more facts from him than most - or possibly chose to disclose more than others. Oh, and by the way, Gabrielle Donnelly is a well-known journalist in Hollywood circles (and has written books too). PAN - Aren't Emily Blunt and her husband friends of G&A? Maybe that's why he opened up to her a little more. Yep, Emily and her husband are friends of George. They were married at Oleandra. ... and that's where and when Felicity Blunt and Stanley Tucci first met, if I remember correctly. Yep, they met at Emily's wedding, but that was actually at Villa d'Este. This is what I was talking about it seemed the wedding took place there. annemarie - How on earth did you find this article It was 7 years ago! Sweet story, though, and not surprising that George "mucked in" moving boxes and tables. He must have been in full "host" mode. I read whole thing. someone ask this writer to read all old interviews and to put together to story. I to no see anything a new. Boy is fat girl is slim yada yada yada. George must to be very scared this movie to be bomb of year he to sell his life showing all reporters pictures of children. Amal must to be angry very very! He isn't selling anything they can't post the pictures , he is showing the reporters he knows. His family has nothing to do with how well the picture does. He is like any other proud dad showing off his babies. Like millions of women, I first fell in love with George Clooney as ER’s Dr Doug Ross back in the Nineties. Such a gorgeous man and a gifted actor, he quickly made the transition to Hollywood and became one of its biggest-earning stars. One of the reasons we continued to admire him was that he seemed so down to earth, unpretentious, and unsullied by all that celebrity glitz. As well as remaining so private about his personal life. We rejoiced when he married the human rights lawyer Amal, although we were rather surprised he chose to stage a £3.25 million, four-day wedding that took over the centre of Venice and was splattered across every celebrity magazine in the world. 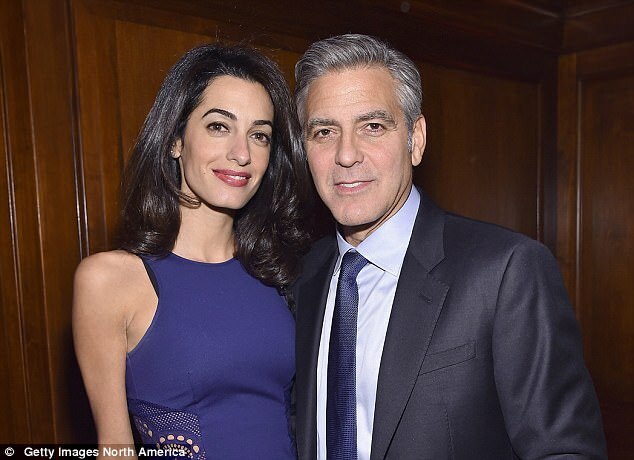 After all, he had just gone to the trouble of persuading the local mayor to apply for restrictions to protect his and Amal’s privacy at his gorgeous Italian villa. Anyone stopping near or even swimming within 100 metres of his Lake Como home faced a £400 fine. Perhaps that was the first hint we had that Clooney allows glimpses of his fabulous life, but only when it suits him. With the birth of their twins, the actor-turned-philanthropist and eco-warrior refused to publish any pictures of their children — to protect their privacy. And when pictures were secretly taken of them over a garden wall and published in the French gossip magazine Voici, he sued, telling USA Today the pictures were taken ‘illegally’. What I can’t understand is why, if he is so keen on protecting his kids’ privacy, he keeps telling us about them. When he’s got a film to promote — as he has at the moment — every time you pick up a magazine or newspaper, including this one, there is another interview with him talking about his children. Yes, the same children he says he and Amal gave ‘normal’ names — Ella and Alexander — so they could grow up like ordinary kids. The boy just ‘eats and eats . . . I’ve never seen anything eat so much in my life’. The girl, ‘she’s very delicate and feminine and all eyes and looks like her mother’, George informs us he cries more than they do, as he’s exhausted by sleepless nights. Because of his age, 56, he worries about being a dad with a Zimmer frame. Fatherhood is fabulous, his wife is incredible, his twins adorable — enough already! You’d think he was the first man on earth to experience the delights of being a father. If anyone is invading the preciously defended privacy of his children, it’s surely George himself. It’s not the first time the eco-minded actor has been hit with charges of hypocrisy. He wants to save the earth, yet was paid millions by Nespresso to promote their coffee pods, which produce mountains of non-biodegradable waste. 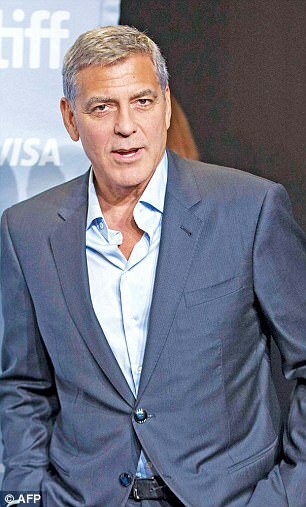 Clooney has been a box office success for most of his film career. We’ll continue to go to see whatever he appears in at the cinema. "You’d think he was the first man on earth to experience the delights of being a father." George himself said that he can't tell anything new about being a father, because it's something that almost everybody experienced. Yes Doug Ross I recall him saying as much. George is a new father who happens to be famous and is extremely proud of his new children and wants to say as much. He doesn't act so affected by his fame and protecting his privacy to the point of not wanting to chat about Ella and Alex. He's doing lots of pr for 'Suburbicon' right now and it's natural for interviewers to want to ask him lots of questions about being a father. But it is on his terms. He doesn't want to do the official photo. That is his and Amal's decision but there is nothing wrong with sharing pics with people he chooses to. And all of this is quite different from protecting his privacy with necessary security in Como and Sonning. I'd agree that Ms. Platell sounds a bit resentful ... or can only appreciate George on her terms. I think she sounds mean . He was asked about the twins and gave a lighthearted response with a dash of humor . Tisk tisk to her .